1. Two Passport size photos each of proprietor/partner/director. 4. Copy of Bank account proprietor/partner ship firm/company concerned. 5. In case of own business place occupancy of self declaration, in case of rented premises rent/leased agreement, in case of partnership firm, copy of partner ship deed, in case of pvt/ limited company copy of registration document (MOA) issued by companies registrar has to be enclosed. 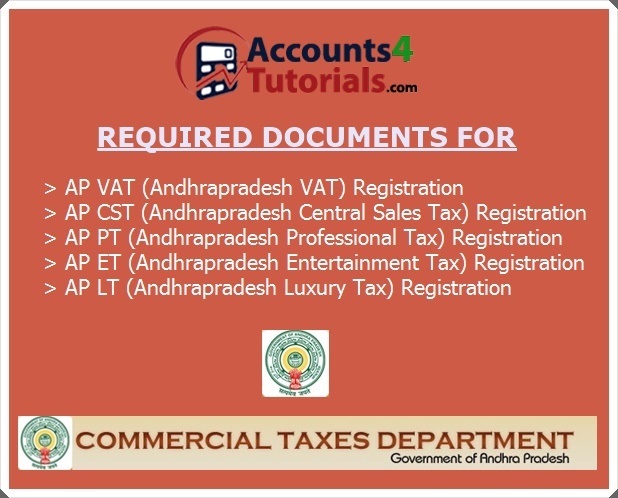 CST Registrations issued to VAT Dealers only, no separate documents required. Two separate RC ‘S issued by the department one RC for industry/firm/company and second RC for employees. NOTE:- All the Xerox copies shall be self attested only. One day from the request received from the applicant subject to receipt of all required scanned Documents Both at Single Desk and to all Circle Registering officers.